I stumbled upon a site yesterday that caught my attention, a database of antique crochet patterns published between the 1920’s to 1950’s (some prior). If you love to create vintage items, this place is a candy store! The site is managed by two people, Tim and Charlene, who collected all these patterns from vintage books and magazines, and have made them available for free on their site, antiquecrochetpatterns.com. On this site you will find projects to crochet baby items, children and adult clothes, home decor, trims and borders, and all kind of accessories. I cannot wait to try some of these patterns, I am particularly interested in the hats and bags since I love vintage accessories. I was browsing through Pinterest this morning when I stumbled upon a pin that made me jump for joy, a free printable gift tag that can be used to give a personal touch to your crochet projects. 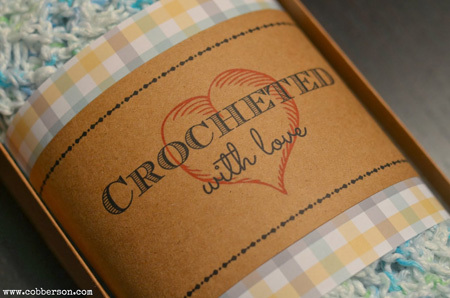 The tag says “crocheted with love” and it even has a spot to write special care instructions. I love the vintage design, she printed hers on brown scrapbook paper. The file is in PDF file format, and can be found on Kym’s blog, Cobberson and Co. This is a really nice touch to add to a handmade gift (note that her tag is for personal use only). First pattern is a really pretty handbag, made by Grace Anne, from WouldYouLikeYarnWithThat blog. I love the ruffles, and the little flower on the side. If you are really crafty, and have the time to make a cardigan, then I would recommend this really pretty filigree cardigan, by Vogue Knitting International. You have to register to the site to access the pattern, but it’s free. For something that doesn’t take too much time, here is a really cute pattern to make fruit coasters, by Sarah, from Repeat Crafter Me. Includes an apple, strawberry, Watermelon, Orange and pear. Flowers! You can never exclude a bouquet of flowers for mother’s day, there are a lot of free patterns available, but here is my favorite one. It’s also from Sarah-Repeat Crafter Me. How about some slippers? I found a really cute pattern on Ravelry, Mother’s Day SPA’s Slippers, by Annoo’s Crochet. They are really pretty, size is 7-8 adult woman. 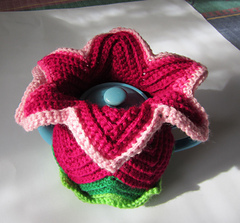 I also love this pattern for a tea cosy, also found on Ravelry. It is called Dailily Tea Cosy, by Jenny Stacey, and it can fit a 2 cups tea pot or a vase. This very pretty Winding Lace Bracelet comes with a video tutorial. The pattern is created by Sue, from Mr Micawber’s Recipe For Happiness. Last but not least, here is a last minute idea. If you run out of time but would like to make something really cute for your mum, here is a very pretty brooch that takes no time at all. The pattern is called Ruffle Rosie Brooch, from Would You Like Yarn With That, created by Grace Ann (who also created the purse I also mentioned on the list). Do you like these patterns? I am still pondering about which one I want to try, they all look so pretty and fun to make. Tulle Momsemor is a blog run by Marianne, a lady from Danemark. She translates free crochet patterns from English to Danish because there are not a lot of them available in her language, and most Danish people do not understand English patterns. All the patterns are turned into a pdf file and downloadable from her site. I got acquainted with Marianne after she sent me an email asking me permission to translate my Valentine’s Day Heart Pattern for her blog. I was delighted at the idea that someone would translate my pattern into another language so that more people would have access to it. If you are from Danemark, or know someone who is looking for patterns written in Danish, I really recommend her site. 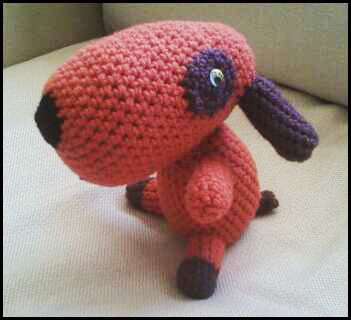 When I decided to make amigurumi dolls a few years ago, I had a basic knowledge of crochet. I knew how to make a chain or basic stitches, but I had never tried to read a pattern. I felt flat on my face when I took on my first project, a basic little bear that looked so easy to make, I thought I would be done in no time until I realized that I was dealing with hieroglyphs. I ended up giving up on the pattern after several attempts at deciphering the “code”, tried to guess what it was supposed to mean and ended up with an hybrid that barely looked like an animal. After that failure, I took a hiatus to give me time to swallow my frustration, and I was ready to give up when I came across a site that turned things around, the Craft Yarn Council. This place is the mecca of knitting and crochet, there I found the translation of all the abbreviations and terminology used in patterns, and learned how to read a project. You can browse through their menu, or download their Standards & Guidelines PDF for a printable version which also contain information on patterns, a guide to yarn weight, sizing, crochet needles, yarn label information. Regardless what kind of project you want to work on, blankets, dolls, clothes, this will help you understand all the basics if you are new to the technical world of crochet and knitting. The site is also a great source of information if you are a designer and want to create patterns. There you can learn how to use the industry standards, write a pattern properly, and download symbols to include in your pattern. I hope you find this link helpful, happy crocheting! Last year I found a great blog that serves as a database for amigurumi patterns. It is called 2000 Free Amigurumi Patterns, and I truly believe they have that many listed on their blog! There is a wide variety to choose from. The blog is maintained by Rob, and updated with new patterns every 2 weeks. You can email him at “free.amigurumi.world@gmail.com” if you have free patterns you want to add to his database. I thought I might as well start my first post by talking about the book that helped me learn all the basics. 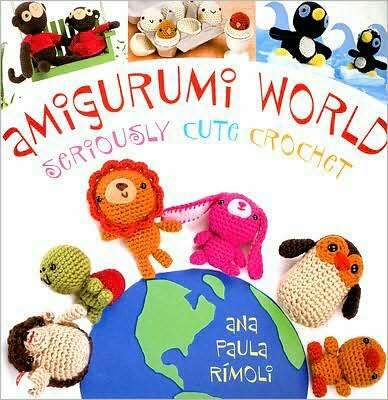 It’s called “Amigurumi World – Seriously cute crochet”, by Anna Paula Rimoli. The plushes are easy to make, and very cute. My first try was the valentine bear. I wasn’t familiar with patterns yet, and how to read them, but hers are very easy to understand. My first attempt was a valentine bear (I could have started with something easier but I was feeling too confident). The result wasn’t bad for a first time, but it wasn’t great either. I wish I had taken a picture! Regardless, I learned a lot from my mistakes, and I quickly picked up on the craft using the many guidelines offered at the beginning of the book. Basics stitches, stuffing, abbreviations, sewing, it’s all there. This book is great for beginners, I really recommend it. I found it at Barnes & Nobles, but you can also order it on amazon. Happy crocheting!